“My fingertips are thoroughly numb, as a lilac dusk descends on Hambacher Forest and the dying light spotlights a solitary treehouse on the Lonely Oak of Lórien. There are now more than three dozen treehouses in the forest, their architects and inhabitants reminiscent of the Band of Merry Men from Robin Hood lore. Lórien is just one of the many scattered activist camps, aptly named after the enchanted woods of Tolkien’s MiddleEarth, an Elven stronghold of resistance against the dark lord Sauron. The elves in this context are Germans, ausländers, teachers, artists, lawyers, teens, elders, people who are standing up to RWE, an electric utilities giant (Sauron) and their planned decimation of this ancient woodland.From the treetops one can see the vast expanse of dust and digested dirt, Mordor, the name given to RWE’s open-pit coal mine, which now stretches over an area almost the size of Cologne, the nearby city home to over one million people. An unnerving calm hangs in the cold, wet air. With every exhalation a little ghost of condensation leaves my lips and I wonder how some people have spent five winters here – it is only November now.” So reads my diary entry dated November 26th from my visit to one of the two most ancient forests in Europe and the people defending it from the ruthless energy giant. Hambacher forest, or Hambi as it is affectionately called by its activist dwellers, is an old-growth forest. This means that it has attained great age, without significant disturbance, thereby exhibiting special ecological features such as madly diversified tree structures & species, immensely rich woody debris and rare, multilayered canopies. Does this matter to anyone?Certainly not to RWE. After all, the company was founded in 1898 and has certainly stood the test of time entrepreneurially, currently owning assets exceeding $100 billion. However, this forest is almost twelve thousand years old. It dates back to the Mesolithic era. The Wooly Mammoth went extinct in Europe when this forest had been around for two millennia. Its assets? Merely the maintenance of biodiversity, water regulation, and cycling of precious soil nutrients, but do such things factor into the value system of the Anthropocene?“All we have to decide is what to do with the time that is given to us”, writes Tolkien, and for the people who chose to move into Hambi half a decade ago the answer was clear. To everyone currently here, the answer is the same – the time that is given to them is poured into protecting this primeval land. There are now nearly one hundred and fifty people living the forest, but this number fluctuates seasonally and numbers in general seem to mean little to the people here.I soon stop asking quantitative questions, they ring far more hollow and unimportant compared to colorful stories and personal revelations about beliefs and experiences, which the forest-folk are keen to share. My friend Vicy and I arrive on an overcast, chilly, muggy morning to the outskirts of the by now naked woods, the recently shed leaves covering the ground and nourishing the ancient soil. As I am perennially on the road, my heavy duty, all-purpose boots come in handy for the piles of mud we have to traverse, Vicy’s sneakers do not, yet she couldn’t care less – we’ve just landed in a childhood fantasyland.We are instantly drawn to the place we later found out is called The Meadow, a little clearing covered in spray painted VW vans, postmodern scarecrows, colourful fences, wise-cracking signs and make-shift structures that look like they’re straight out of The Goonies, or The Little Rascals or Grimm’s Fairytales. My associative memories are on fire and one corner looks just Asterix’s Gaul, from another I’m expecting to see Viggo Mortensen and his six kids emerge from their Captain Fantastic reshoot, and the whole scene leaves me wondering Where the Wild Things Are?People are milling about, getting on with whatever work needs getting done and they pay us no mind, so I ask the first person I make eye contact with if they know where Miri is (the person I’ve corresponded with via email). The pale young man with a goatee, smirks and says “I’m Miri”. Reading the bafflement on my face, he explains “we are all Miri, it is the name we all use for all communications”. I’m immediately recalling ‘I am Spartacus’ and swooning over the solidarity. Miri tells us to follow the water carriers until Gallen, I turn to Vicy and ask if Gallen means anything and she says Gaul. Of course! We must be off to see Getafix. We enter Gallen which feels like you’ve literally walked into an indie pop music video, think early MGMT, meet Empire of the People, meet Milky Chance. Like a wood nymph, a sweet, doe-eyed young woman, named Indigo emerges through the trees and asks us if we’re the ones looking for a tour. She’s no Getafix, but we nod and we start our walk. Our winding tour quickly becomes populated with a host of incredible characters, such as the priest who holds masses in protest of RWE, has already chained himself once to a tree when things got hot, and has given the Hambi activists his word, that should they need extra support against tree cutters he will mobilise his entire congregation. We meet a father of two who tells us how when he was cycling though the forest with his children, police officers told him that he should avoid this area because its dangerous to which he replied ‘“Yes, it is dangerous because you are here’.We meet a young filmmaker who is making a documentary of the forest community and has been living there for a couple of weeks now. He heard about a crazy bunch of people living in the woods for years, trying to save it, and of course that was all that was needed to lure him in. 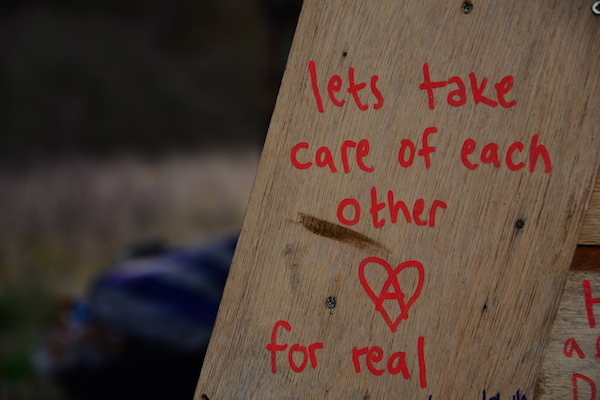 Everyone here has a different story, each one unique, but all connected to a strong emotion, whether it is the sanctity of trees, or loathing towards big corporations or simply the freedom of the offgrid life – people here are living life in a radically different way to their peers back home. Of course the one who stands out the most, is the Mother of the Forest, whom we heard about and then got lucky enough to see. While I was essentially envisioning Khaleesi, Beate Martin is just as badass, simply with a few years on Daenerys Stormborn, aka Pensioner Khaleesi. She moved to this area over twenty years ago and has been visiting the forest folk for the past five years, usually bringing food or treats or coming to prepare big pots of hearty stew for the scrappy treeclimbers. 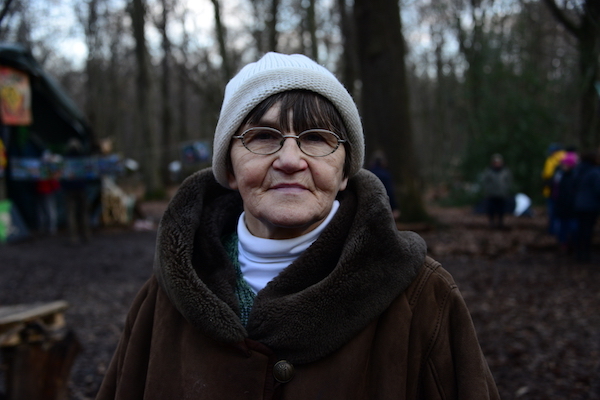 Beate is 85 years old and she is every bit of an activist as the average Hambiite, she is a sustainer, one who enables the frontliners to keep on fighting. As we’re continue our walk, Joni Mitchell’s lyrics creep into my head, “they took all the trees, and put ’em in a tree museum, And charged the people a dollar and a half just to see ’em”. Never did I think about just how prophetic Big Yellow Taxi is, “hey paved paradise to put up a parking lot”. 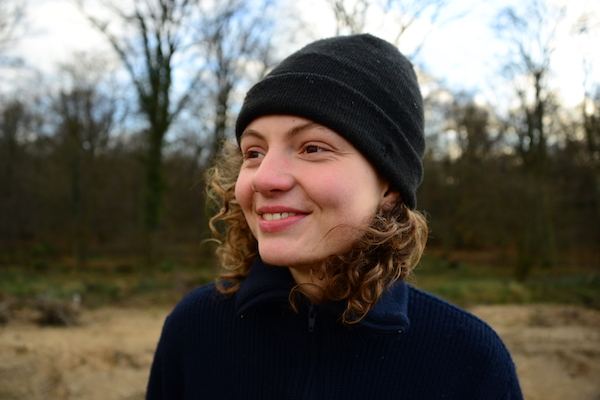 I ask Indigo what the relations are like between the activists and the miners or the townspeople, and it seems that there is mutual understanding, the one issue that everyone raises is the jobs RWE provides. Indigo labels this ‘a racist discussion’; she cannot equate the loss of jobs in Germany with the loss of lives due to climate change in the Global South. She has thought deeply about these questions and feels the collective guilt of the West that she is now standing up against.The other activists we meet, Dante, Diam, Owl, they are all trying to live out an alternative, and they’re being much more professional about it than one might expect from a band of treehouse dwellers. They hold daily sleeping plenaries to ensure that everyone is rotating and that top real estate is shared, they have open fora to express concerns or ideas, they run monthly and weekly organised tours ‘Radical Walks’ for large groups who come to visit. They have solar panels up in the trees, they power computers, charge phones, and even have a little windmill in the Meadow. 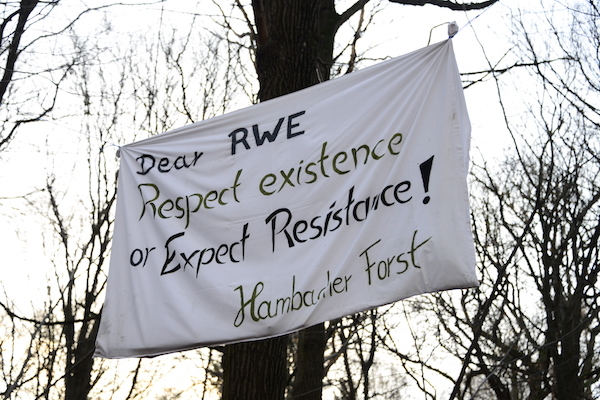 I steer our conversation towards RWE as I wonder how they are not inundated with bad press and citizen outrage. Indigo’s answer is that open pit mining is just not newsworthy, even though Amy Goodman had arrived with the Democracy Now! a few days ago, this coverage wont make too many ripples locally. “And RWE is good at hiding what they do”, she elaborates, ‘if you drive on the highway close to the open pits here—because it’s not just one, it’s quite a few—you see hills next to the highways, and on the hills, there are solar panels. And there are like trees next to the highway that says “Tree of the Year 2008,” “Tree of the Year 2009.” Actually, one other absurd thing is that this counts as reforestation, if all these trees are just right next to the highways.But RWE also has like a fancy place where you can see the pit and where they have like signs on where they explain how great this technology is and that they have the biggest diggers in the world and so on. 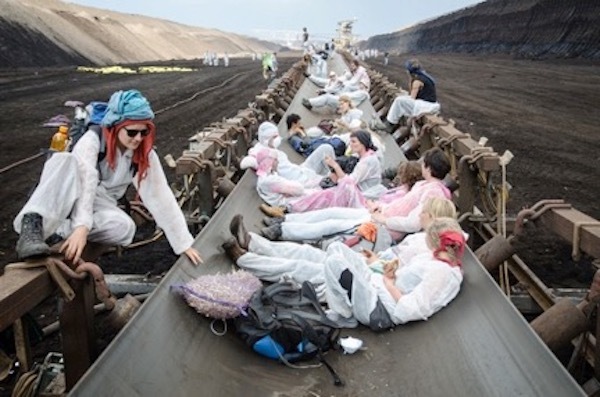 And actually, some people go there to just have a Sunday trip with their children or even to celebrate a wedding.’ I cannot really get over the fact that somebody would get married in from of RWE lignite mine, of their own free will. Indigo seeing that I’m dazed continues, “it’s so absurd, they’ve named the platform Terra Nova, which means “New Earth”… so we then named our compost toilet Terra Nova”. Clearly, there is a stark competition between narratives, one of regeneration versus extraction, of the metallic versus the wooden, of close community to faceless business. At a time when renewable energy milestones such as Costa Rica going 100% renewable for 300 consecutive days are part of the present it is mindboggling that existing business interests refuse to take losses even if they be massive, and change course.Groups such as Urgewald are pushing for divestment from dirty energy and have even made the Coal Exit List to make divestment as clear and simple as possible. 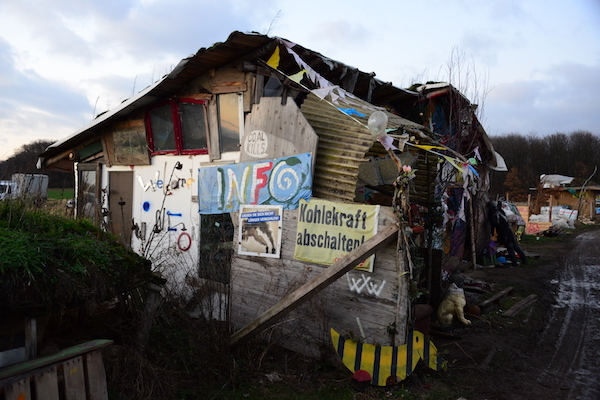 The large anti-coal movement in Germany Ende Gelände (roughly translated End of the Road) is capturing popular imagination through crafty occupations and effective visuals and recruiting more young people to participate in dynamic civil disobedience actions throughout the country. They stand loudly and proudly alongside the Hambi crew. Memories of Middle Earth continue to buzz in my brain, much like the dwarves we have delved too greedily and too deep, and in the darkeness we awoke shadow and flame.We are seeing the consequences of our greed, yet they are most apparent farthest from the source, those who do not reap the direct benefits of the greed are the first to be impacted by it. Tolkien wrote ‘if more of us valued food and cheer and song above hoarded gold, it would be a merrier world’ and it is quite a merry world we see here in the forest.A few days following my visit, RWE was supposed to start clearing a large part of the forest, and they had commenced cutting in the very last days of November. Luckily, a court order, petitioned by BUND Friends of the Earth Germany and a coalition of pressure groups, put an end to the cutting, or at least postponed it until the autumn of 2018. While this seemed like good news, such is the game of attrition. People tire over time or they simply leave and RWE can then make its move, therefore the struggle continues.There is a scene in Blade Runner 2049, where a character is shocked to see a flower. Plants no longer exist in our world. Trees, bushes, flowers, all long gone. In fact there are now adults who have never laid eyes on a living flower before. The moment is harrowing. The character is told about trees in a way we would talk about dragons or fairies, as if they were these magical beings that vanished long ago. 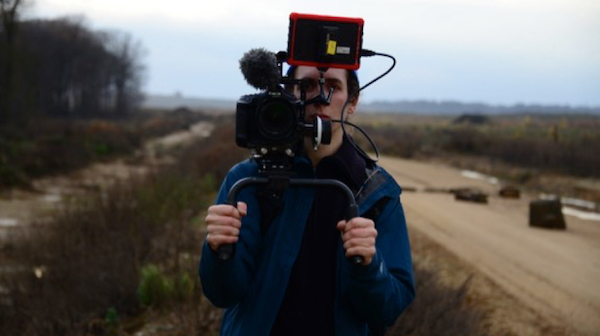 So the question we are left with is do we let Hambacher Forst become a legend, or do we ensure it remains in our present.As we drive off, sitting in hot guilt for the fuel we are guzzling, I recall the quote attributed to Alanis Obomsawin, the one that surfaces and resurfaces on the net so often that I’ve become desensitized to it. “When the Last Tree Is Cut Down, the Last Fish Eaten, and the Last Stream Poisoned, You Will Realize That You Cannot Eat Money”.Turns out all it took for resensitizing was a walk through the woods.